The Leigh Collection is a limited time fall/winter style and color palette. 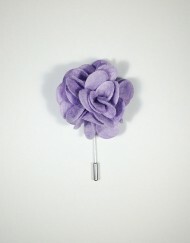 The lapel flowers are medium sized with just a hint of a sheen to them. The loopy design makes the flower a fun accent to any outfit, casual or dressed up.